DMV.com was created to help simplify your life by providing you with all the vehicle related information and Missouri DMV services you may need, in one place. Quickly find information and services regarding driving records, vehicle registration, drivers license renewal, license plate renewal, getting a learners permit, and finding a Missouri Department of Motor Vehicles approved traffic school. A Missouri drivers license is required before residents can drive. Learn about DOR guidelines for the drivers license application and more. Order your Missouri driving record online to avoid a trip to the DMV. Requesting MO driving records online is the most convenient method. The DOR requires MO auto insurance for all car owners and operators. Get car insurance today using our convenient online insurance center. Enroll in a driver improvement course approved by the state of Missouri. Our MO traffic school lets you dismiss an eligible traffic ticket. Take a DOR practice test before you sign up for the Missouri drivers exam. An MO DOR practice exam will test your knowledge of traffic laws. Car registration is required by the DOR for Missouri car owners. Learn how to get car registration papers and how to renew or replace them. Missouri drivers education helps new drivers to obtain their DMV drivers license. Register for drivers ed in MO, and discover its benefits. Obtain a Missouri car sales receipt, or vehicle bill of sale, from the DOR. A bill of sale records a vehicle’s transfer of ownership. Drivers must respond to MO traffic tickets to avoid penalties. Find help for contesting a traffic ticket and paying traffic tickets online. Getting a DWI in Missouri results in an automatic license suspension. Learn about other DWI consequences enforced by the Missouri DMV. Before you buy a car in Missouri, review our tips. Learn how to buy a car online in MO to make your DMV new car registration process simple. 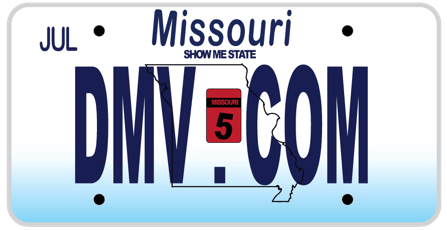 Find a Missouri DMV location near you to obtain DMV services. Get DMV contact information to make an appointment quickly and conveniently. Exclude MVDL’s bureaucracy. Visit DMV.com and let it guide you through all the info for drivers license, vehicle registration, license plate, emissions and other motor vehicle issues online. Looking for information about titling and registering a motor vehicle, trailer, boat/vessel, or all-terrain vehicle? You’re on the right spot! DMV.com will help you deal with the Missouri DMV quickly and easily. The vast majority of informative and how-to-do articles, all necessary forms and manuals on our site are neatly organized and they’re one click away from you. Whether you’ll choose to navigate around it by using the search bar or its navigating sections is completely irrelevant, either way you’ll get exactly what you need in few seconds. Being a privately owned site makes DMV.com free from any government liaison. Our first and most important priority is to be fast and accurate in helping you fulfill Missouri BMV requirements. As a private electronic medium, we make you avoid waiting in lines and all that irritating government bureaucracy. Instead we provide the info that you need from the comfort of your home. However, you can help us get even better. Comment on our pages/articles, engage with us on Facebook, give us feedback and help us remain the best site in dealing with dmv issues.